What qualifies me as a current QMS customer when I register? Current QMS customers are businesses who have negotiated terms with Quality Mill and have an account number. If you buy for a business and would like to set up terms with us, please visit the new business account registration page. What qualifies me as a new consumer account when I register? New consumer accounts are for individuals who are buying for personal use (not for a business). If you are buying as an individual, please visit the new consumer account page. What qualifies me as a new business acount when I register? 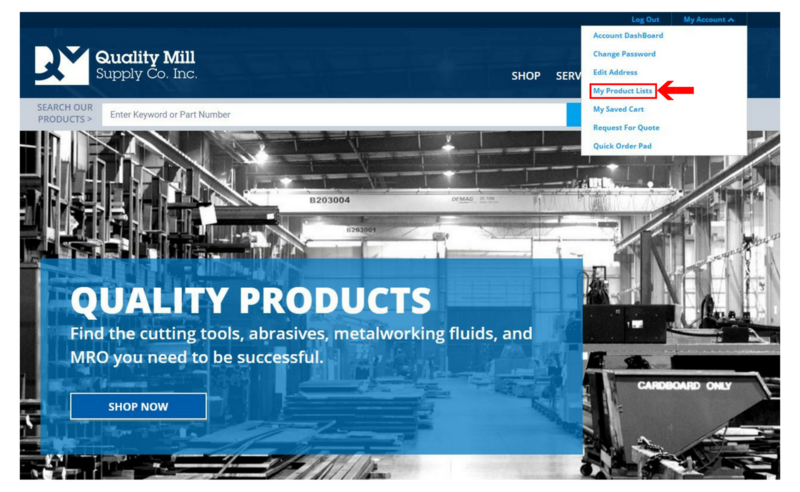 A new business account is a business that has not previously purchased from Quality Mill and would like to purchase using a PO. 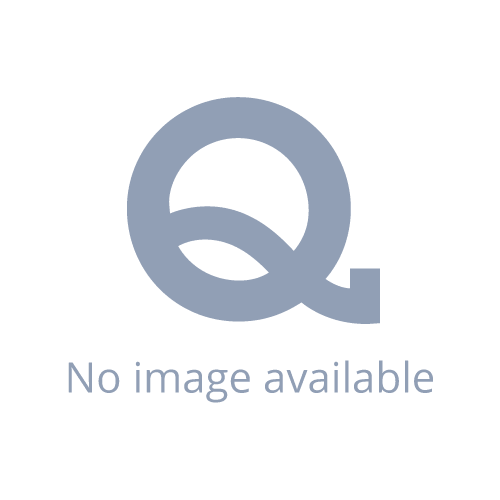 I am registering as a current QMS customer, how long will it take to become fully registered? A QMS representative will complete your registration and notify you via email as soon as possible, but allow for 1-2 business days. When logging in, is my email and/or password case sensitive? Your email is not case sensitive; however, your password is. For example, password and PASSWORD are different. You must enter your password exactly as you have set it at. Visit the forgot password page and follow the instructions. You can also click the login button in the top right corner of the webpage, from there click the forgot password button. You will then be prompted to input an email address that will contain a link to create a new password. Click the link and create a new password for your account. While logged in to your account, you can change your password by visiting the change password page and following the instructions. You can also click the "my account" tab in the top right corner of the webpage. From there, select "change password"; follow the instructions and click "save". You will receive an email to the address associated with your account confirming that your password has been changed. Why can I not sign in? - Have you registered? If not, please register. - Ensure that you are using the correct email address associated with your account. - Ensure that you have entered the correct password, remember that passwords are case-sensitive. How do I edit my ship-to address? How do I edit my bill-to address? If you are a non-commercial account, you will be able to change your bill-to address during the checkout process. My email has changed, how do I update it? If you are a non-commercial account, you will be able to update your email address while logged in by clicking the "my account" tab in the top right corner of the webpage. From there, select the "edit address" option. Once on this page, you will see an email address field; input your new email address here and click update. Your new email address will then be saved. What do I do if someone leaves our company/gets assigned a new role that does not involve them purchasing from the website? Please contact us at qmsecom@qualitymill.com . If you would like to be set up as an administrator for your company, please let us know as well. What search terms should I be entering in the search box? What if I cannot find the product I am searching for? What is "my product list" and how does it work? 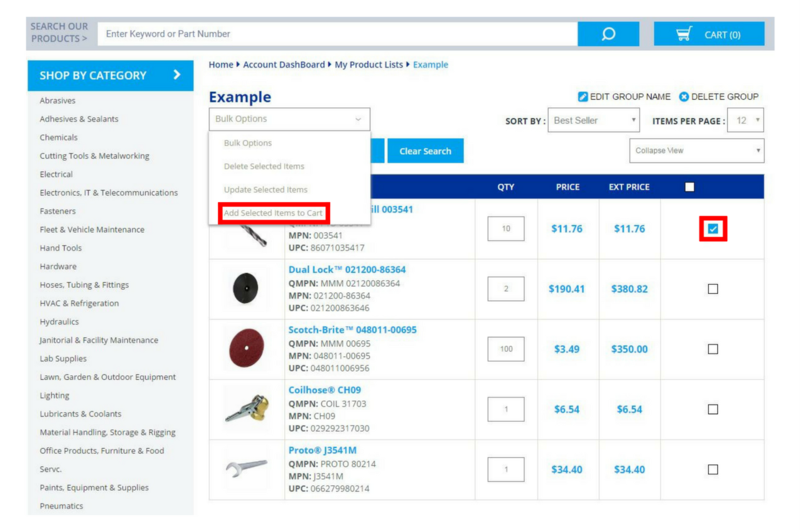 The my product list feature allows you to group commonly purchased products into a list that can be easily added to your cart, reducing the time searching for products. 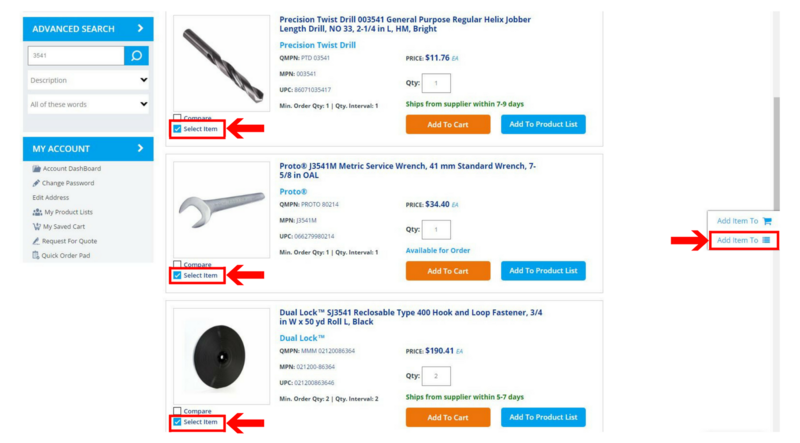 This feature can be utilized by finding the commonly purchased product, then selecting the "add to product list" button located next to the "add to cart" button. If you are creating a new list, create a title for that list and press enter on your keyboard. If you are adding a product to an already existing list, select the list from the drop-down that appears. 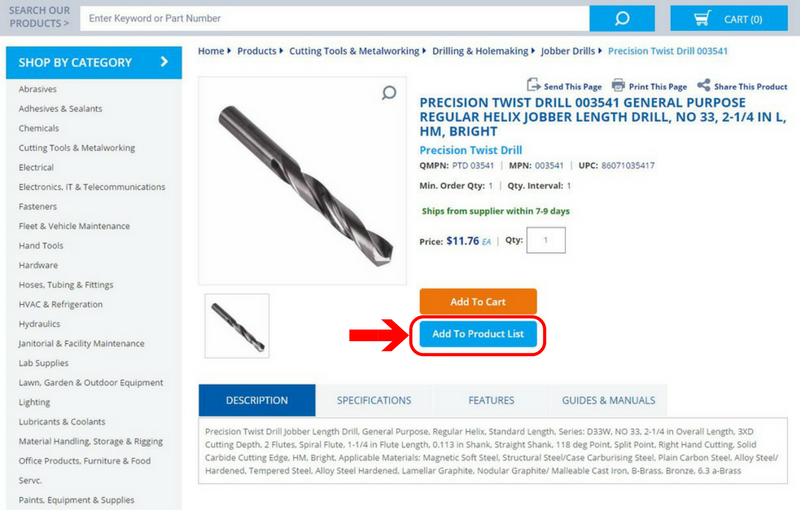 You can also select multiple items to add to your list at once by checking the "select item" button underneath the product image, then click the add to list button located to the right of the page. How do I access my product lists? 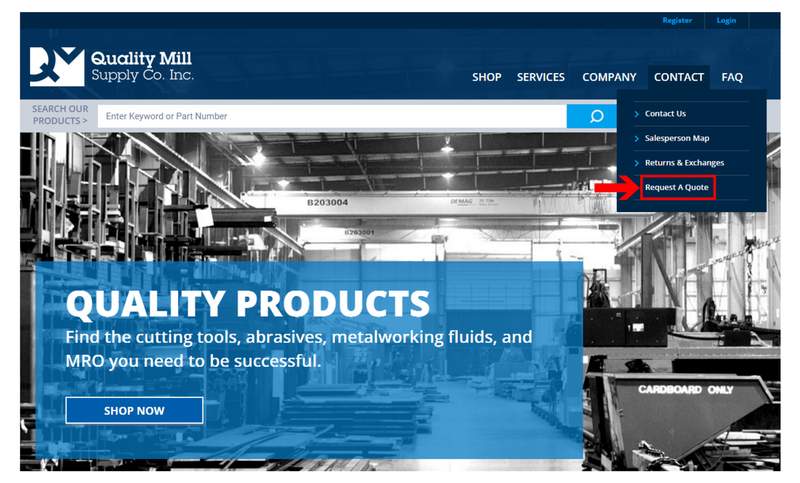 To access your product list , first ensure that you are logged in to your account, then select the "my account" drop-down located in the top right corner of the page. From there, select "my product lists" and select the list you wish to see. How do I update my product list? You can edit your product list by selecting the item(s) you wish to edit and changing the desired quantities. Once you are finished with your edits, in the "bulk options" dropdown menu, click "update selected items". Once this is done your product list will be saved. You can also delete items from your list by selecting the product you wish to take off then selecting "delete selected items". The item(s) you have selected will then be taken off your list. How do put items from my product list to my cart? 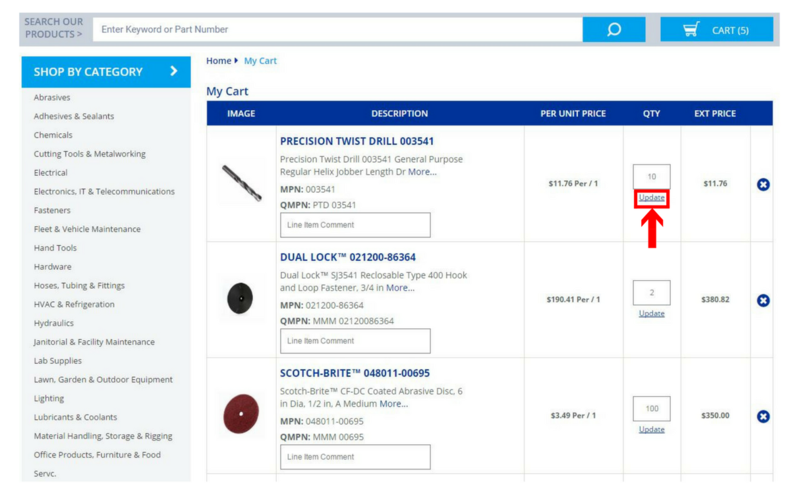 To put items on your product list to your cart, select the item(s) you wish to move, under the "bulk options" dropdown menu, click "add selected items to cart". Once the item(s) from your list have been added to your cart, you are then able to checkout or continue shopping. Who should I contact for specific questions about products? How do I know that my order is being processed? After you have submitted your order, you will receive an order confirmation instantly. Check your junk mail or spam folder if you do not receive a confirmation email. Within one business day of receiving your order confirmation, you will receive an order acknowledgment, letting you know that your order has been processed and has shipped/is ready to ship. Why did I receive an email saying that my order failed? Please make sure that you paid with either a Visa or Mastercard, our site does not accept American Express or Discover credit cards. If you did pay with an American Express card, please rerun the order and pay with either a Visa or Mastercard. How do I adjust an order that I have placed? An order cannot be adjusted or canceled through the website once it has been made. Depending on how long ago the order was placed, you can contact customer service at (317) 489-0600 or customerservice@qualitymill.com to make adjustments or cancellations. When looking at your cart, click the "save cart" button located next to your total. You will then be prompted to name your cart. Input a name, then press "enter" on your keyboard, and your cart will be saved. How do I access my saved carts? 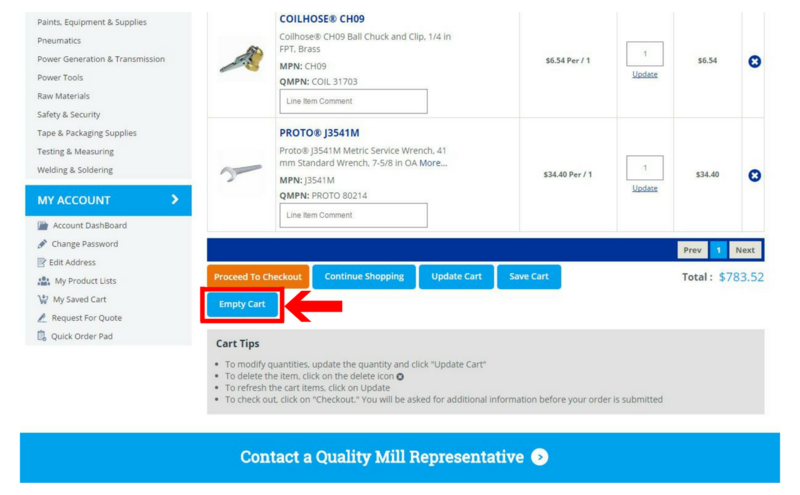 To access your saved cart, first ensure that you are logged in to your account, then click on the "my account" dropdown tab located in the top right corner of the page. From there, click the " my saved cart " option and select the cart you wish to view. How do I clear my shopping cart? When looking at your cart, click the "empty cart" button located below the list of items in your cart. You will then see a window appear asking you if you are sure that you want to delete all items in your cart, click "OK". Your cart will then be cleared. You will receive invoices via mail, e-mail, or fax, depending on how your account is set up. How do I review my order history? 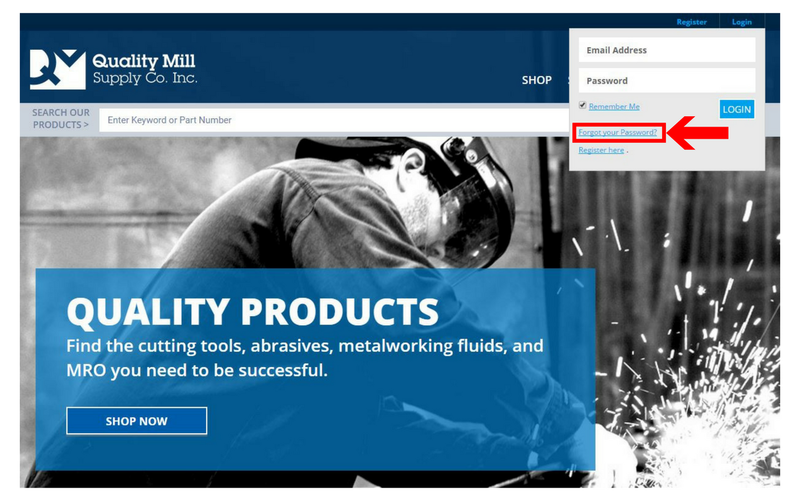 Once logged in to your account, go to the request for quote page (located under the "my account" tab in the top right corner of the webpage, then click "request for quote" and fill out the necessary information. You can input the Quality Mill part number, manufacturer part number, brand/MFR name, quantity, and/or short description of the product. The more information you input, the more accurate your quote will be. How do I change the quantity of an item once it is in my cart? 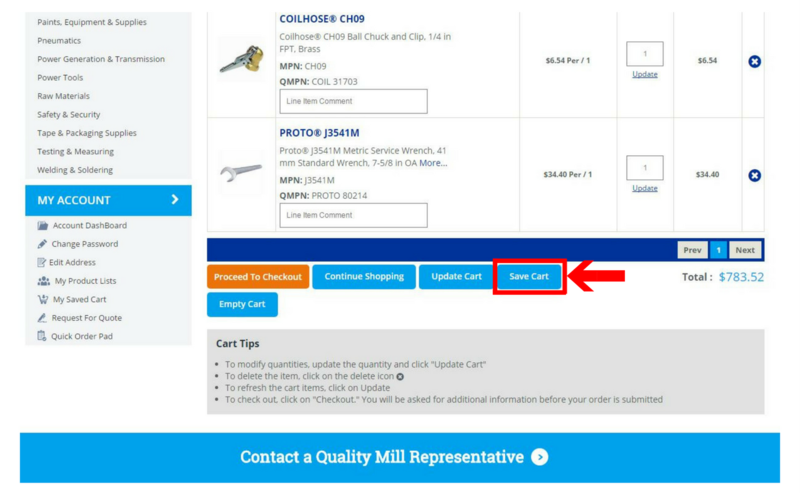 When viewing your cart, input your desired quantity then click update located directly below the quantity entered. 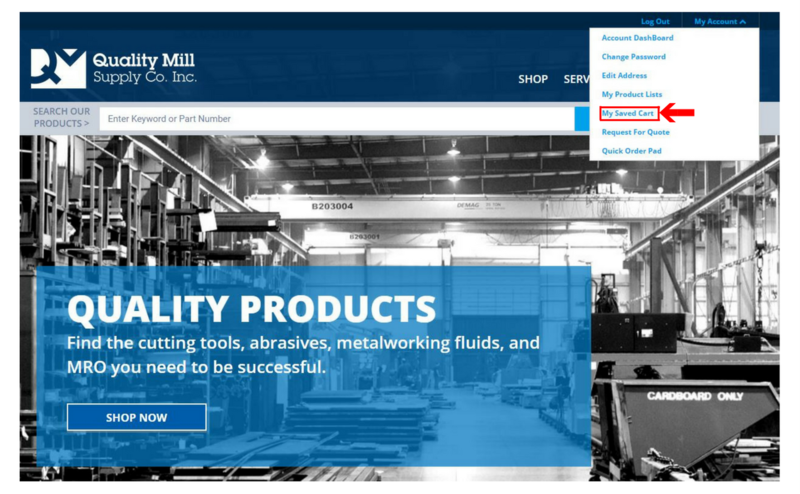 Does Quality Mill Supply fulfill international orders? No, we do not fulfill international orders. What other ways can orders be placed? How are delivery dates determined? Shipping costs are determined by the weight of the item(s) and location to be delivered to at standard ground speeds. What are the expedited shipping options available? We have a variety of shipping options to suit your needs, contact customer service at (317) 489-0600 or customerservice@qualitymill.com customerservice@qualitymill.com for more information. How are chemicals and hazardous materials shipped? If an order contains hazardous materials, it will be delivered by Quality Mill (up to 1,000 lbs.). Any non-hazardous material (chemicals) will be shipped via UPS Ground. What hours is general customer support available? What hours is e-commerce customer support available? After submitting a "contact us" form to Quality Mill, how long will it take to receive a response? A response will come as soon as possible but allow for 1-2 business days.